“There are some children’s picture books that, when you hold them in your hands, fill you with great promise, and this is one that delivered its promise. From the moment I snuggled with my 17 month old grandson and we settled, ready for this story, I could tell the book’s cover had captivated his attention. Once I began to share the story with him, he was entranced. The book cover is a classic illustration with real vintage tones. Illustrator Briony Stewart used coloured pencils to achieve her gorgeous illustrations and show the softness and texture of each picture. There are many hidden images on each page and my grandson particularly enjoyed pointing out the hints of lions on the pages, including the shadows. Author, Emma Middleton’s use of natural rhythmical and rhyming text is an absolute delight to hear and begs to be read aloud. The text is light, witty and playful. It charms, captivates and entices young readers, ‘Will he come? Won’t he come? Will he come and play?’ It teases, beckons and leads the reader on a gentle story about a beautiful relationship between a father and his children, Tilly and Tom. “Middleton’s lilting prose creates a teasing sense of expectation in this playful story about the relationship between a father and his two young children. Warm and fuzzy in its delivery, this tale takes little ones on an enticing adventure laced with the prospect of play. They quiver with anticipation and feign fear as they wait in hope for the lion to appear. When he finally does, it’s all about bedtime stories and snuggles. In this delightful and playful picture book by Australian talents Emma Middleton and Briony Stewart, two young siblings, Tom and Tilly, eagerly await the arrival of a lion. A thump, a crunch and a roar, and the mighty lion comes though the door. Of course, the lion is really Dad playing. Tom and Tilly enjoy lion rides, play chases and have loving lion cuddles. I adore this book for so many reasons. Firstly, the story is just wonderfully fun to read. Written in beautifully flowing rhyme, with engaging repetition, it’s got a bouncy and addictive rhythm that makes it perfect to read aloud. Perfect for reading to groups, too. The illustrations by Briony Stewart are stunning. Detailed and softly coloured, the pictures are full of life, and they invite you into this family’s world, making you feel like you’re part of it. These are illustrations with magic powers. They’ll make you feel all warm inside and entice your hands to touch all the pages. And then there are the beautiful themes: love, family and the special bond between kids and their fathers. I love how this picture book shines a light on dads and the unique kind of adventurous fun they seem to be so good at. In this heartwarming sequel to The Lion in our Living Room, Tilly and her younger brother Tom head outside to wait for the bear in their backyard to finish napping and come out to play. Our big brown bear was sleepy. We love our bear the best. Our games are so much better after bear has had a rest. Part of a special game between child and parent, the bear is, of course, not really a bear. Emma Middleton has once again delivered a gorgeous story that celebrates the special connection between children and their parents, and it’s all about mums in this loving tale — a mum with a teeny tiny secret that isn’t revealed until the end. 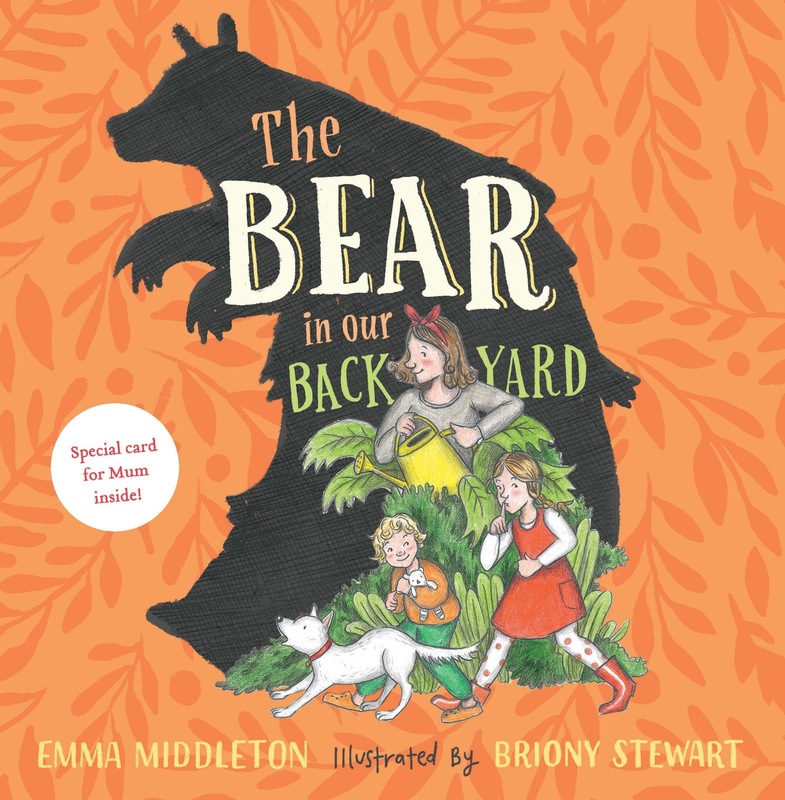 Paired with Briony Stewart’s divine illustrations, The Bear in Our Backyard is a magical book to explore, with beautifully soft colours filling every corner of every page and character expressions that radiate love and the powerful connection of family. With rhythmic rhyme flowing throughout, this is the perfect book for bedtime snuggles. And with Mother’s Day just around the corner, it also makes a loving gift from child to mum or for new mums with bubs on the way (it even comes with a bonus card to make gift giving a breeze! ).